Fifteen years in business-now there's a reason to celebrate! 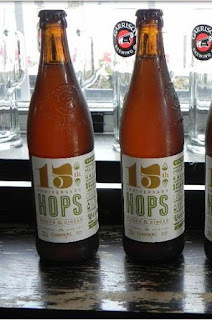 To commemorate this milestone, Garrison released the first of two unique, specialty brews at the 15th anniversary party held at the brewery. The theme for this first release is a celebration of a key brewing ingredient - hops! A whopping 15 distinct hop varieties have been added to the boil along with loads of real mango's and fresh, shaved ginger. "15th Anniversary Hops, Mango & Ginger" is sold in 500ml single-serve bottles ($5.50) at the brewery store and all four private stores while supplies last.